This Ceramic Dome Water Filter replaces all your Zen Water System Filtration systems both Countertop and Water Cooler models. The Micro-Ceramic Filter is made of highly compressed ceramic with diatomic properties; resistant to extremely high temperature. The Ceramic Filter will keep dirt, sand, other particles from getting into Zen's drinking water. 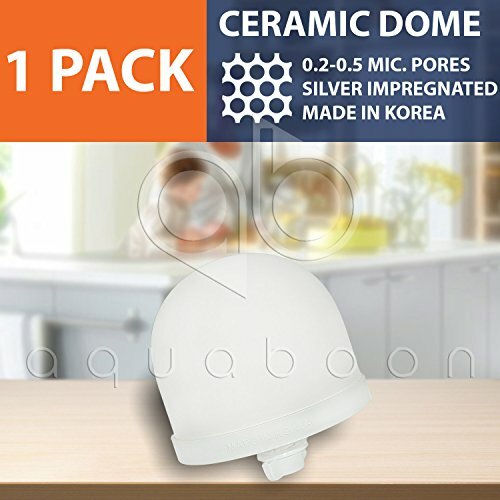 Replace your Filters frequently to ensure optimum performance from your Zen Water Systems.The surface of the dome consists of millions of pores that measure 0.2 micron in diameter, while most bacteria is 0.5 to 1.0 microns in size. • The Ceramic Filter has a pore diameter of 0.2 micron while inorganic compounds range from 0.3 to 1.0 micron in size. The ceramic filter dome is secured inside the top tank. When contaminated water is poured in the filter, it will trap dirt, debris, contaminants and most bacteria before the water passes to the "clean" side of the filter to ensure that your water is free from any harmful diseases such as typhoid, cholera and dysentery. Instructions We encourage our customers to clean this filter at least once a month or as frequently as necessarily, depending on the quality of your local municipal water. A layer of trapped dirt and gunk would accumulate on the surface, clogging the pores of the filter and slowing down the drainage of the water. The ceramic filter dome should be handled with care. Do not use the ceramic filter if it is cracked or damaged.